Holidays may affect normal operating hours. For information on holiday closures, click here. The Chickasaw Cultural Center opened in July 2010 as a place to celebrate, embrace and share the culture that binds the Chickasaw Nation together. It is one of the largest, most comprehensive tribal cultural centers in the country and has won numerous awards. It was selected as the Best Cultural Heritage Experience by the American Indian and Alaskan Native Tourism Association and was also named as CNN's top travel destination for Oklahoma in 2014. Set foot onto the stunning, 184-acre campus and you'll see architectural elements like native stone, wood and copper that hearken to the natural beauty of Sulphur's surroundings. Venture inside and you'll be greeted with a whirlwind of artistic showcases, interactive media stations and hands-on exhibits. You'll begin in the Chikasha Poya Exhibit Center, where an array of interactive experiences awaits. Wander through the Spirit Forest, alive with sound and color; witness a stomp dance demonstration, displayed in an interactive, 360-degree format; or learn about the journey that thousands of Native American took in the 1800s in the Removal Corridor. Next, discover the Fine Art Galleries and see how the Chickasaw people have created ceramics, jewelry, carvings and woven crafts for centuries. The Aaittafama' Room houses rotating art collections throughout the year, and the Aapisa' Art Gallery, meaning "a place to see" in the Chickasaw language, is where traveling exhibits from across the world can be enjoyed. Then there's the Anoli' Theater, featuring 350 seats and a 2,700-square-foot screen. The theater screens films about Native American culture or those made by Chickasaw citizens. It also plays host to popular films, like "Jurassic World" and "The Avengers," that are also open to the public. The on-site Aaimpa’ Café is where visitors can sample an abundance of traditional dishes. Pashofa, known as the Chickasaw national dish, is made with cracked hominy corn. Indian tacos are a meal in themselves, made fresh in the kitchen, and grape dumplings are a favorite dessert. Plus, fresh produce for the café is grown in the Spiral Gardens on the Cultural Center’s grounds, not far from the Living Village, where visitors can participate in 18th-century Chickasaw life. 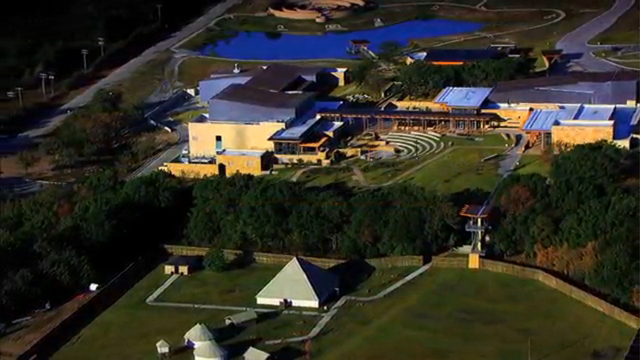 Visiting the Chickasaw Cultural Center on Chickasaw.tv. And there's even more to see and experience on the Campus Grounds. Walk through the Aaholiitobli' Honor Garden to pay tribute to Chickasaw leaders, elders and warriors who paved the way for Chickasaws today. Relax in the Oka' Aabinilli' Water Pavilion, which features a deck that extends over a serenely landscaped pond. Admire "The Arrival" and "The Warrior," two bronze statues that truly symbolize Chickasaw history. Experience cultural demonstrations in the Kochcha' Aabiniili' Amphitheater, and admire the view from the Aba' Aanowa' Sky Pavilion. Plus be sure to visit the Holisso Research Center, where anyone can stop in to study Chickasaw and Southeastern genealogy. And don't forget about the gift shops!